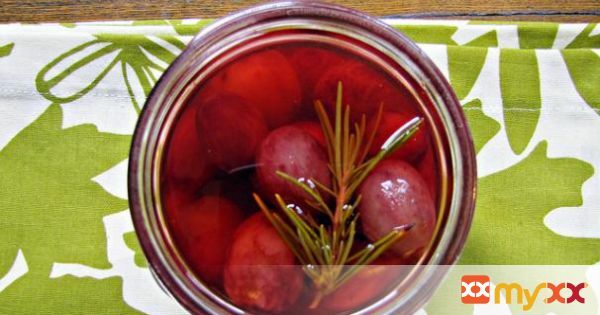 Pickled grapes make a perfect appetizer bit alongside olives and cornichon. They are also excellent tossed in salads. 1. Pack grapes into 3 pint-size jars. 2. Pour vinegar and water into a saucepan over medium-high heat. Add salt, sugar, garlic, rosemary, and chile flakes. 3. When mixture begins to simmer, remove from heat and divide the brine among the jars. 4. Cover loosely and let cool to room temperature. 5. Cover tightly and chill in refrigerator at least one hour before serving. 6. Pickled grapes will keep in the refrigerator about 2 weeks.